Moodle is a platform for conducting online courses through the web. 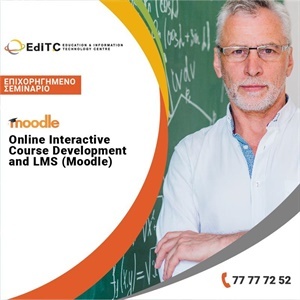 The name Moodle is an acronym for Modular Object - Oriented Dynamic Learning Environment (Modular Object-Oriented Dynamic Learning Environment). Currently the most popular e-learning platform and widely used around the world. As a free software / open source software enables not only free for use, but also the freedom to adapt to the needs of each user, so it also is available in over 78 languages, including and in Greek. · Teachers, teachers, teachers of all levels and disciplines who want to use a Moodle platform for their courses. · Professionals from any field who wish to use Moodle for the education and evaluation of the company's employees. · All the people who want to become more effective and productive in their work through the use of e-learning platforms Moodle. · To establish a platform Moodle locally. · Formulate the home page of their choosing platform. · To create a structure with categories, sub categories. · To generate lessons that will serve their needs. Lecture, discussion, demonstration and practice.